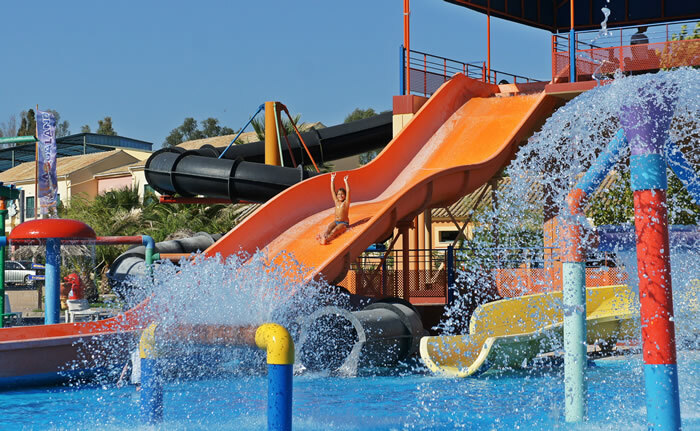 Transfers Corfu is organizing tour to the amazing water park “ Aqualand ”. Aqualand is one of the most fascinating and adventurous water parks in Europe for children and for all those adults that are still young in spirit. The Aqualand waterpark is open all day from 10:00 am – 06:00 pm. At the time requested from you and your group of people, your coach will pick you up from your hotel and drive you to Ag. Ioannis village, just 7 km from Old Corfu Town center, where the waterpark is situated. Aqualand is an area of 12.000 sq m, where there are water rides and slides, rivers and pools with plenty of fun and excitement on over 15 different water-themed rides and attractions for all who want to have fun with their friends of family. Into the waterpark there are free sunbeds and umbrellas, spacious changing rooms and showers, high quality fast food, restaurant and gelateria, boutique, mini-market and fast photo-print shop, safety lockers available, wet and dry central bar, available to the guests to enjoy their time into and outside the water. During your stay qualified lifeguards will be looking after you. Aqualand is one of the most famous destinations for the visitors of Corfu island. It is open from early in the spring until the mid of fall and with Transfers Corfu you will be able to be transferred safely and on time from your hotel or maybe the cruise ship to the waterpark and back.